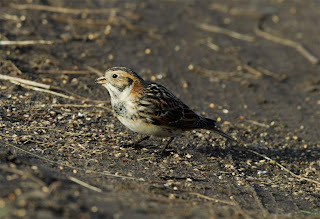 Over the past few weeks there have been some very approachable Lapland Buntings or as the Yanks would call them, 'Longspurs' showing on the Ancient Highway near to Mary Bax Stone on the Sandwich Estate. Having finally found time to pay a visit to the 'seeded' track I was not disappointed despite waiting nearly 2 hours for some Bunting action. On arrival the Laplands were playing hard to get as some walkers had the cheek to use the public footpath and the Buntings had become birder shy!! 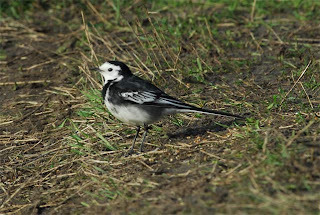 Fortunately no one else was walking that morning and the chosen hallowed ground on the public footpath was host to two Skylark, a cracking Pied Wagtail then finally a mega Lapland literally a few feet from the car! With the camera ready for action the memory card set to work and I managed a few shots that I was happy with. Job done, next stop the Snow Buntings on the shingle bank near the old club house. The Snow Bunts weren't in residence though and the beach footpath was heaving with people, dogs, and joggers. A long long walk up towards Shellness Point in Pegwell Bay to check the hundred acre field, yes all 100 acres of it failed to give us the hoped for Jack Snipe and we settled for a superb rusty Woodcock seen twice in flight, 30+ Snipe and a Sparrowhawk. 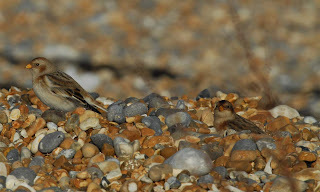 Luckily on the way back the Snow Bunts were feeding happily on the shingle ridge, mission completed. Next stop was Stodmarsh and a stroll out to the Marsh Hide for the last few hours of daylight on what was a glorious sunny day. We met Dylan in the hide who was photographing the avian events that included a Little Egret and a bathing Grey Heron. 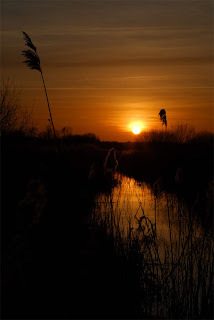 Three plus Water Pipits were distant but seen well through the scope and the sunset over the reed beds was fantastic. A great day out and an opportunity to see and photograph Lapland and Snow Bunting.